It was heavy rainny day yesterday, but today is sunny. The carpenters started to break the roof again from this morning. By the way when I went to the postoffice, I went to the beach to take a photo. 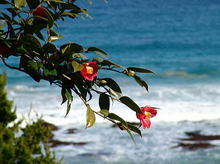 Then I found the tree of "Tsubaki" (Camellia) by the sea. The color of red of Tsubaki and blue of sea are really beautiful. This entry was posted in Flower, Sea on 2006年2月2日 by izusakuraya.